Life is filled with challenges. Sometimes, one must overcome obstacles that occur at birth, while others are met with adversity through accidental or aging processes. Having w orked with the disabled population for over twenty years, first as a special educator and then school psychologist, my presence in the school system was one of champion and protector. In turn, I endeavored to advocate for children's' inherent strengths rather than those apparent deficiencies. Throwaway dogs or throwaway children  the concept remains the same in a society that oftentimes strives for excellence in narrowly defined ways. Yet, there is a Golden lesson that needs to be learned about the incredible struggles and strengths that many must endure  and that powerful light that burn s within all beings, humans and Goldens alike. 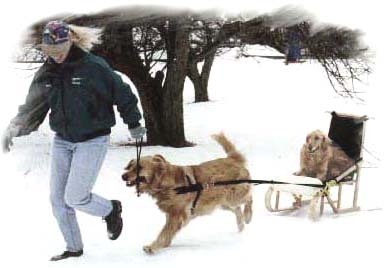 This page is dedicated to those families who share their lives with challenged Goldens. The first special story that I learned about was that of Lucy, a beautiful Golden girl who suffers with Spina Bifida. Lucy has many many friends, both two and four-footed. Here is friend Shirley leading her Golden Lucas, who is giving Lucy the ride of her life. Living in New England's harsh cold climate, though, can create its very own unique challenges. Want to know what happens when it snows 30 inches, and then another 10 inches? Well, for one thing, poor little Lucy has to stay in the snow blown paths so she can pish and poop! Find out more below about this special girl and how her ability to meet life's challenges is actually setting an example for us humans. 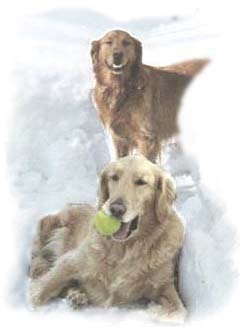 Please take time to experience Lucy's story as well as that of other remarkable Goldens. And, explore the many resources available for addressing the needs of those with mobility and sensory challenges. Why the Deaf Dog Barks What Causes Deafness in Dogs?